A couple of weeks ago, a generous friend invited me to a show at Caesars Windsor, near Detroit. We decided to take the day off work and make a day of it. Instead of shopping for clothes, we went decided to go to Trader Joe's, since we don't have access to it in Canada. 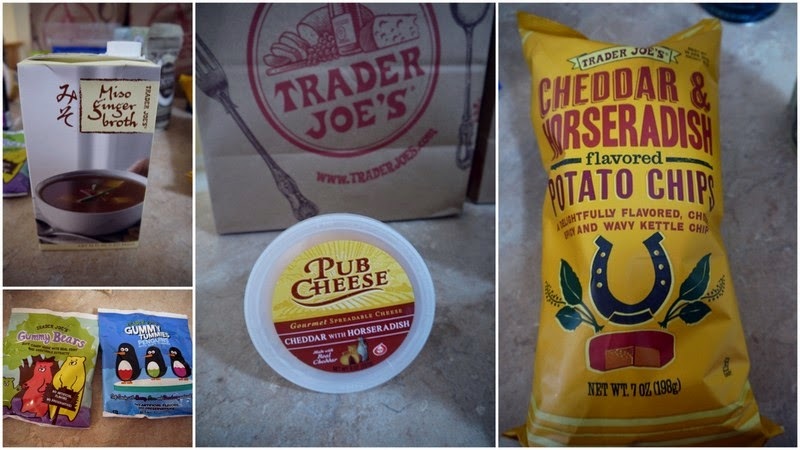 This isn't a sponsored post or anything, I was just very excited to visit Trader Joe's in Grosse Pointe, Michigan and check out all the exciting products they have. Trader Joe's is famous for their store brand products. They have a particularly great selection of nuts, grains and dried fruit at great prices. They also have some awesome cookies and snacks. I love dark chocolate almonds as a snack. Both of these versions are very delicious. Coconut, chocolate and almonds is a wonderful combination. These pantry staples are interesting. It may sound lame, but I love checking out grocery stores for neat stuff. Pine nuts usually cost a fortune but these were very reasonable. I put the flax seed in my morning oatmeal or smoothies. I haven't tried the barley yet, but I think it'll be convenient for weeknight dinners. I was excited to see this quartet of spice mixes. These will be great for the barbecue once the seasons change. Cookies! It was hard to choose, but out of all the cookies, I got dark chocolate covered triple ginger cookies with candied ginger inside (fantastic! ), mini "caramel bites" which are really stroopwafels, my favourite Dutch cookie, and Cookie Butter, which I gave to my sister-in-law instead of keeping for myself. More coconut treats! Roasted coconut chips are delicious but very expensive in my local market. It's just shaved toasted coconut that's crispy and sweet. I haven't tried the toasted coconut pancake mix yet, but I think I might fire up the waffle maker to try it out this weekend. A few other things I picked up were gummi bears, miso ginger broth, pub cheese with horseradish and horseradish potato chips. When we were recently in Kentucky we enjoyed "beer cheese" and brought some home. This is similar, a cheddar spread with spices or horseradish. It's delicious on plain crackers or toast. So much fun to see all these new products we don't see every day here in Canada. Can't wait for my next trip!